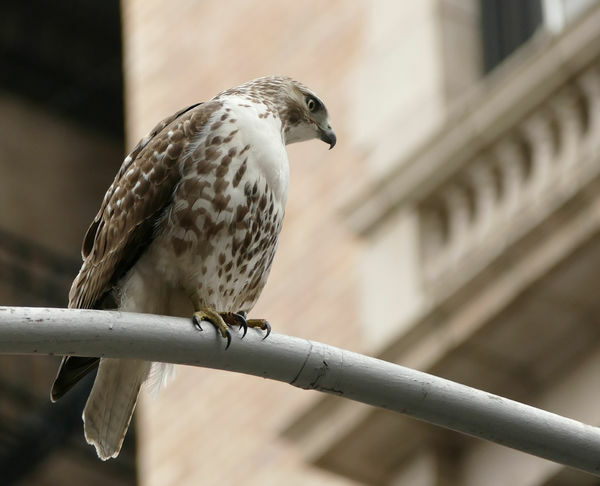 I was walking along west 109th street in Manhattan and in the distant saw a hawk on a lamp post, rushed to take a photo, the hawk flew away. Half an hour later the hawk came back to the same lamp post, and I'm ready ! Grabbed a few sitting shots and before I knew it, it took off and I just squeezed the take button. It was plain luck ! As you guys know I'm not a nature /bird shooter but an architecture guy. This bird has a home nearby and I've been trying to catch it with its mate, all in one shot. Two-in-one is difficult! You may want to check out the peregrines that live in the tower at Riverside Church. There are kestrels living in SoHo, and red tails, coopers sharp-shinned and other hawks all over the city. Central Park is a great spot for raptors, especially near the Museum of Natural History, and the garden behind the Met. Columbus Park in Chinatown, and Tompkin's Square Park has a red-tail pair and a nest. There is lots of food around, so they flourish in NYC. 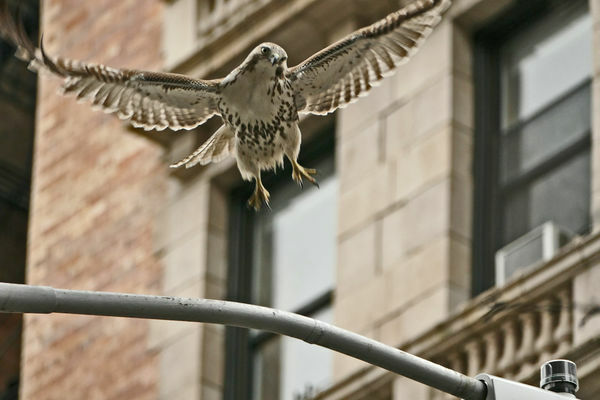 Very nice captures, Peter...keep the NYC raptor photos coming!! Great photos! Back in the 80’s the windows at the photo studio in AMNH always had binoculars at the ready. The staff I worked with were avid and knowledgeable birders, I tried to pick up what I could from them. Across the street, Central Park was a hot spot for birds. A beautiful Red-tailed Hawk, thanks for sharing! I've seen Peregrine Falcons flying between the buildings in Boston for a good many years. They help keep the wild pigeon population in check.